Based in Cotter, Arkansas, Hogs on the Fly specializes in guided fly fishing on two of the most underrated trophy trout, blue ribbon, tailwaters in the country: the White River below Bull Shoals Dam and the Norfork tailwater. Both river systems are loaded with an abundance of four species of trout including trophy browns, rainbows, cutthroats, and brook trout. Our specialty begins with providing a stellar experience followed by a meticulously planned approach on fishing these ever-changing ecosystems. 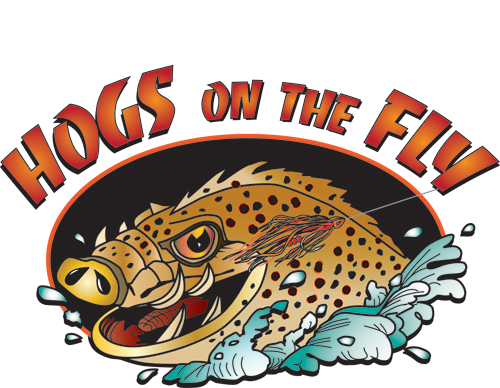 What separates Hogs on the Fly as a premier fly fishing guide service? Passion, differentiated methods for each season and client requirements provide answers to that question. The trinity paragraph below will dissect this philosophy. These tailwaters are dynamic and offer many opportunities to change techniques over the course of the year. Nymphing year round is always productive. Midges, sowbugs and scuds suspended under an indicator will do just that. Think of this as the celery of the Trinity. An often overlooked aspect of these fisheries is throwing dries such as caddis, sulphers, and hoppers. During the right time, nothing is more exciting than watching a trophy brown surface below a well presented dry fly pattern in anticipation of a big strike. We’ll say this dry fly action is like the onion of the Trinity. For those in pursuit of a trophy trout that are willing to cast heavy line thousands of times, streamer fishing is the ticket and my specialty. Don’t anticipate many stockers committing to chasing and eating a 6” plus articulated fly since that’s what the big hogs are looking for. This technique requires zero complacency as a violent strike may occur at any time. So get your hat on tight! We’ll refer to this as the green pepper of the Trinity. Hogs on the fly is not your stop for a one trick pony experience. Pick your passion and follow this site to key in on the best time of year to get your fill. Or fish with us every season for the full flavor of the Holy Trinity. Want variety in your Arkansas fly fishing experience?